A glossary comprising 27 terms commonly used in the framework of the EU’s Eastern Partnership has been produced by the ENPI Info Centre, with the support of DG RELEX and EuropeAid. The six-page ‘Eastern Partnership glossary’ is available in English and Russian, as well as in the official languages of Armenia, Azerbaijan, Georgia, Moldova and Ukraine. All the translations have been approved by the European Commission. The aim of this unique publication - handbook is to assist people understand the terms and expressions used when referring to the Eastern Partnership, a policy that seeks to bring closer the EU and its six neighbours in the East, namely Armenia, Azerbaijan, Belarus, Georgia, Moldova and Ukraine. The publication, laid out in A to Z format and easy to print, covers a variety of terms and expressions, ranging from “approximation to the EU acquis” and “bilateral track” to “conditionality”, “enhanced cooperation”, “flagship initiatives” and “panels to support the work of thematic platforms”. It also explains numerous policies, like the Black Sea Synergy, cooperation programmes like TRACECA and INOGATE, and includes some of the financial instruments available to the partner states such as SIGMA and TAIEX. 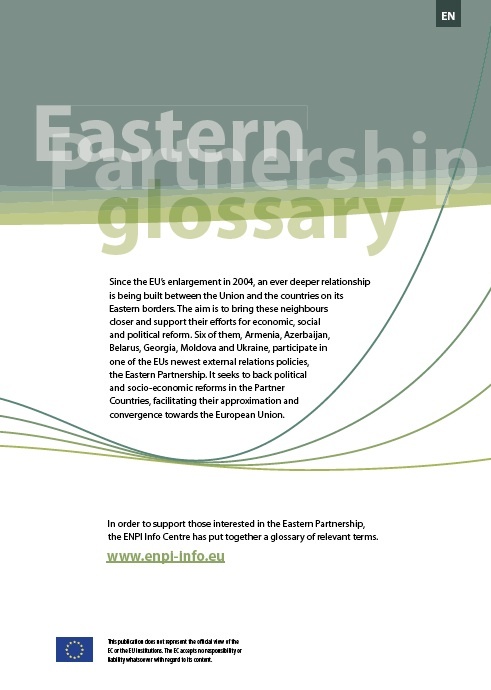 The ‘Eastern Partnership Glossary’ is available in electronic version and can be found on the ENPI Info Centre’s website, at: http://enpi-info.eu/files/interview/glossary_en.pdf. It comes to supplement another glossary covering general terms related to the European Neighbourhood Policy (ENP) and its financial mechanism, the European Neighbourhood and Partnership Instrument (ENPI), also prepared by the ENPI Info Centre and available from: http://www.enpi-info.eu/main.php?id=403&id_type=2. Furthermore, a number of thematic glossaries, jargon guides and acronyms have been collected by the Info Centre and can be found under the “Resources” section of its website: www.enpi-info.eu. Since the EU’s enlargement in 2004 an ever deeper relationship is being built between the Union and the countries on its eastern borders. One of the EU’s newest external relations policies, the Eastern Partnership, seeks to bring them closer, support their efforts for economic, social and political reform and facilitate their approximation and convergence towards the EU. The Eastern Partnership is explained on the ENPI Info Centre website and the “EU and Eastern Neighbours” section on: http://www.enpi-info.eu/maineast.php?id=506&id_type=2.